Prime Minister David Cameron is due to meet leftist Greek Prime Minister Alexis Tsipras on Thursday, amid fears of a Greek exit from the Eurozone. The meeting is expected to address the standoff over the Greek government’s debt. 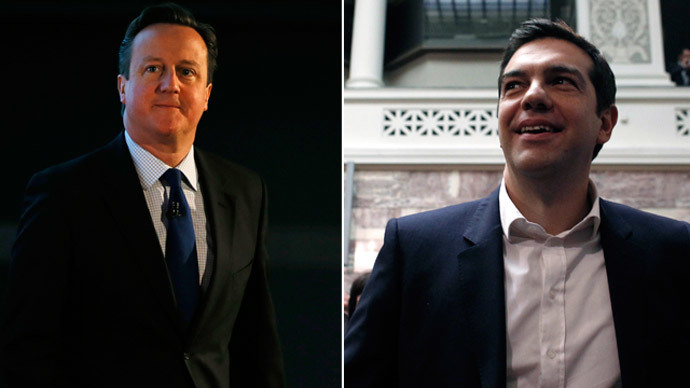 Cameron will hold one-to-one talks with Tsipras, whose newly elected government has signaled it will turn to Russia or China should debt-laden Greece be forced to exit the Eurozone. German Finance Minister Wolfgang Schäuble rattled European markets after he warned that tough measures would be taken against Athens if it did not adhere to the terms of its IMF/EU bailout package. Thursday’s meeting in Brussels is Cameron’s first with Tsipras, since the head of Greece’s leftwing Syriza party was elected prime minister. Cameron is expected to urge Tsipras to strike a deal with Greece’s Eurozone creditors who are angered by Greece’s plans to restructure its IMF/EU bailout package. Greece’s anti-austerity government presented its first formal proposals for a revised debt plan on Wednesday at emergency talks in Brussels attended by Eurozone finance ministers. Tsipras’ government wants to scrap 30 percent of its obligations to international creditors under its IMF/EU bailout program, and replace them with newly devised reforms. The bailout package is due to officially expire on February 28. The Greek government says it does not wish to extend it. Rather, it has requested a “bridge agreement,” which will enable Greece to stay afloat until a revised 4 year program can be brokered with its Eurozone creditors. The Syriza-led government says the strangulating terms of its €240bn (£182 billion or $272 billion) bailout have plunged Greece into abject poverty. It has rejected the TROIKA (EU, IMF and ECB) as the body responsible for monitoring how its bailout is implemented. Thousands of anti-austerity protestors rallied in Athens on Wednesday in support of their government’s plans to reform Greece’s debt obligations. Cameron, who congratulated Tsipras personally following Syriza’a election victory, has remained relatively neutral as Athens’ row with Eurozone creditors intensifies. However, Cameron fears the implications of a Greek exit from the Euro. Britain’s links to the Troika of lenders are marginal, with Britain holding shares in the IMF. The PM held a meeting of the coalition’s emergency planning group, Cobra, to discuss the situation on Monday. Cameron’s allegiance ultimately lies with German Chancellor Angela Merkel, whose finance minister Schäuble continues to defend Greece’s bailout package. But a Downing Street official told the Guardian the PM’s message to Eurozone leaders is to negotiate with the Greek government and broker a path forward. Cameron’s meeting with Tsipras is scheduled one day prior to an EU summit in Brussels broaching new governance structures for the Eurozone, the crisis in Ukraine and counter-terrorism.